This must be the hottest property in Painscastle. In the winter of 1969 it burned down under the name “Maesllwch Arms”. In the summer of 1991, under the name ”Black Ox”, it again went up in smoke. For a number of years it remained a burned out eyesore until it was lovingly restored in 2005. It now looks exactly like a very old inn! My suggestion that it reopen under the name Burnt Ox was turned down in favour of “Roast Ox”. But a burning down makes it much simpler to modernise the basics and up to 16 guests can now be offered en-suite twin or double rooms. 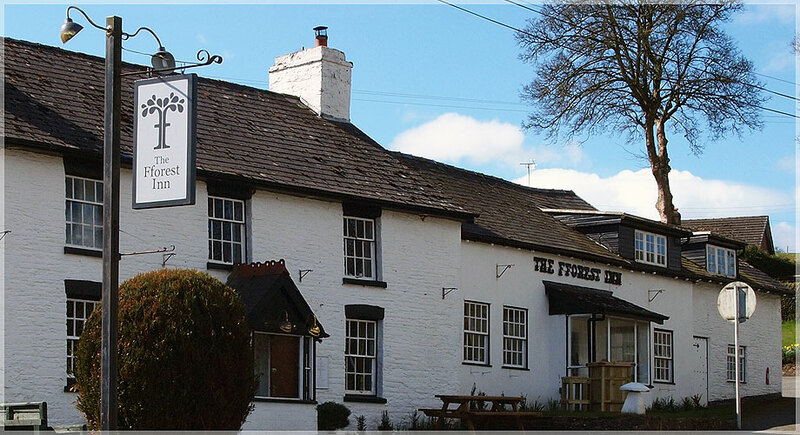 Freerein riders often stay here during Learn to Ride and Guided Trails. It is a good overnight stop for riders wanting a great ride from Freerein HQ. There are open fires in the old bar and a varied local menu. It is perfectly situated just five minutes up the lane and out onto the firm grassy tracks across the open heather and bracken hill tracks leading across Llanbedr, Rhulen and Llandeilo hills and out across the Radnor Hills and Cambrian Mountains. The Roast Ox is now managed by Tony Jones and his team who offers excellent food, drinks and accommodation to Freereiners. Please note that when rides stop here overnight your horses will be staying a few miles away, you will be transported to and from the Roast Ox by road. Goblaen Guest House is a fantastic place to stay. Friendly hosts and great food.